Smart Website Creations is a professional web design agency located in Suwannee, Georgia. We specialize in developing websites that are easy to use and attract customers. Designed for the small or budgeted project, but flexible enough to give a professional internet presence. Designed to give your site increased functionality for your business needs and provide better online recognition. Designed for e-commerce, media intensive websites, and clients with needs for high volume of pages. There is already talk about your business online; getting help from a professional web design expert helps you control the conversations. You have a web presence , even if you don’t have a website. The internet has opened the door to the many different ways customers can talk about your business, bad and good. Nowadays, consumer interactions do not take place only in store. If Mr. Customer is satisfied or annoyed, he doesn’t simply tell his friends. Mr. Customer logs onto the World Wide Web and tells his story to the entire world. Customers are able to spread the word about your business easier than ever before with the help of review websites, social media networks and other varied web outlets. Whether this is positive or negative, without a controlled web presence, that feedback will be the only thing a future customer finds when searching your business. Negative reviews or critical feedback posted online won’t just disappear by simply owning a website, but by being a part of the conversation, you demonstrate that your business is committed to its customers. 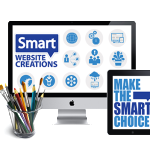 Make the Smart Choice, Get a Smart Website. Call us (901) 255-2572 or email us for more info. *SEO applied to homepage only. **SEO applied to each page. ***Includes 5 pictures per product.